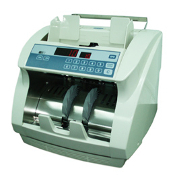 The CDM-13 UVMG (with Ultra-Violet & Magnetic counterfeit detection) is a High Speed Currency Counter which counts bills (old and new) up to 1500 bills per minute and features touch sensitive controls, automatic and manual start, user adjustable batch stops and a grand total accumulation of all noted counted. Compact design. High capacity document feed. It comes with the only self-cleaning patented system in the world, a Dual Dust extractor fan in order to provide more durability and reduce maintenance costs. Batch presetting from 1 to 999. Addition mode for total notes counted. Alarm for possible errosrs (Double, Chain). Ultra-Violet and Magnetic counterfeit detection.